If you’re like millions of other people out there, you may have noticed some small white bumps under your eye. Not satisfied with just accepting them, you’ve probably wondered what those peculiar lumps under the surface of your skin are? They may look like spots, but when you have tried to squeeze them, they have stayed firmly embedded under your skin. Now they are just a part of you, like that scar on your elbow or that birthmark on your chest. You see them every morning in the mirror and remind yourself to Google what they are – after all, it could be something sinister – but you always forget to investigate. Well, now you don’t have you worry any longer, because I have all the answers you need about those pesky pimples. Their technical name is ‘Milia’ and they are pretty harmless – even so, there are some things you need to learn about the tiny bumps. Milia is most often seen around the eyes, nose, forehead and chest. However, they can appear anywhere on the body. It’s particularly common with babies, but it can affect people of all ages. So now you know the basics, it’s time for the science behind the abnormal spots. 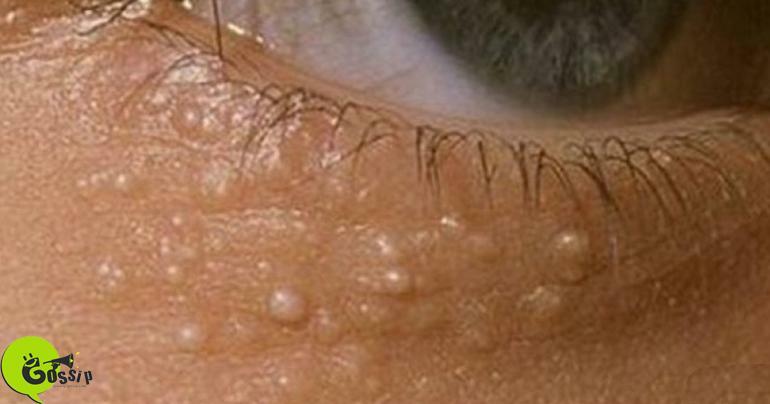 Milia are in fact a type of skin cyst filled with a protein called keratin. The cyst occurs when keratin, typically found in skin tissue, hair and nail cells, becomes trapped beneath the surface of the skin. If that wasn’t technical enough for you, then how about this: there are five different types of Milia, each of which has a special scientific name. There is ‘Primary Milia’ which is the most basic form. It usually disappears after a few weeks or months. Then there is ‘Milia En Plaque’ (not as edible as it sounds), which is commonly associated with genetic or autoimmune skin disorders. Then there is the slightly sinister sounding ‘Multiple Eruptive Milia’ which consists of itchy skin around the torso, face and upper arms. If that wasn’t intense enough, then the ‘Traumatic Milia’ certainly is. Although, it is actually less horrific then it sounds, for ‘Traumatic Milia’ refers to the white bumps that can appear around a healed wound, severe burn or rash. Then there is ‘Milia Associated with Drugs’ which is caused, as you may have guessed, from the use of steroid creams – although this is rare. Okay, so now we have established that, your next question no doubt surrounds how you can get rid of them! The treatment is easy, if you have the correct equipment and enough patience and nerve. All you need is sterilized tweezers or a needle, which you can use to carefully make a small tear in the skin in which the content of the Milia will pop out from. Once extracted you can see that what was hiding in there all along was a small ‘pearl’ – a hard, round shaped orb which is usually white/yellow in color. If your Milia is in a sensitive spot, such as your eyelids, it goes without saying that it’s best to get a professional to tend to it. There are also several home remedies that can be found in the video above. To keep it from returning, dermatologists recommend that you cleanse, tone and moisturize regularly to keep the skin clean and clear. So there you have it, the truth about those pesky pimples!